I am not and probably will never be, a lace knitter. I can’t seem to follow patterns, and even worse, when I do, I invert numbers and stitches so the whole thing tends to come out wonky. But this yarn is so delicious that I decided to just start knitting. 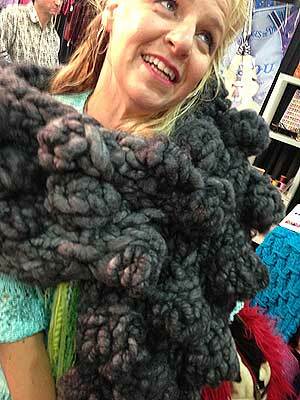 I’m going to just do some kind of single stitch wrap, just so I can feel this around my shoulders. 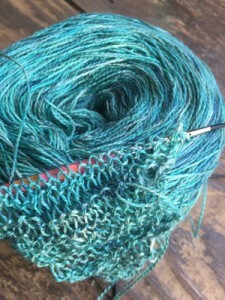 If you’ve never knit with Tosh Silk Lace, and you ARE a lace knitter – then I would HIGHLY recommend. This is Big Sur – a beautiful green tonal, with lots of different colors in the skein. I just love it! (so does my dog). That is an amazing colorway! Still working on my first laceweight project with Malabrigo lace. I love that no matter what you make with a laceweight yarn, it is absolutely beautiful.